Artist Danica Phelps stands amid panels of her work in Manhattan's Lower East Side. When the end of a longtime relationship cost artist Danica Phelps her home, she used her creative energies to chart the troubled period in her life. The result: A work of art that incorporates an eight-page court ruling that she says pushed her down the path toward foreclosure. 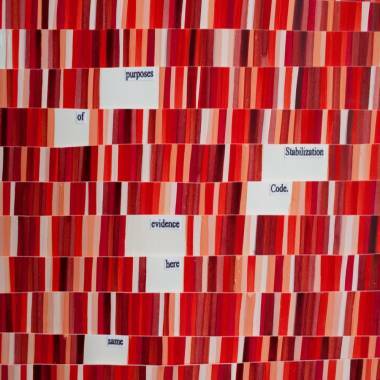 Titled "The Cost of Love," the 25-panel piece weaves 350,000 tiny red-hued stripes -- in shades of cherry, burgundy, peach and pink – together with words from the ruling, including "animosity," "eviction," "mortgage," "girlfriends," "child," "donor" and "insemination." "This is the whole decision represented in these panels," Phelps, 40, said recently at Brennan & Griffin, the art gallery that represents her and is showing her work in Manhattan's Lower East Side neighborhood through Sunday. "I didn't want my emotion to be represented. What I wanted was to put out this word for word and to allow the viewer to have their own emotional reaction to it." Phelps, who has used similar striping in previous pieces, said the genesis of her latest creation occurred in 2009, when her relationship with an ex-girlfriend unraveled and she decided to move out of the four-unit apartment building she owned in New York. After moving in with relatives and unsuccessfully attempting to persuade her ex to move out of the apartment they had shared for three years, Phelps initiated eviction proceedings. But on June 2, 2010, Housing Court Judge Laurie L. Lau dismissed the case. Because Phelps and her ex-girlfriend had been a “familial unit” when they moved in together and jointly parented a now 3-year-old-boy named Orion born to Phelps through artificial insemination, Lau wrote, the latter was not subject to eviction under New York City law. "While their relationship has obviously deteriorated into one of animosity and hostility, the evidence establishes the parties had intended to form a lasting familial unit,” the judge said. “It has been held that 'lifetime partners whose relationship is long term and characterized by an emotional and financial commitment and interdependence,' ... satisfy the definition of 'family' for purposes of the Rent Stabilization Code." Phelps then decided to stop paying the mortgage on the apartment building, which is now in the midst of foreclosure. A real estate agent is trying to help her arrange a short sale (an agreement between a lender, a buyer and a seller in which the lender agree to accept less than the total loan) to avoid that. 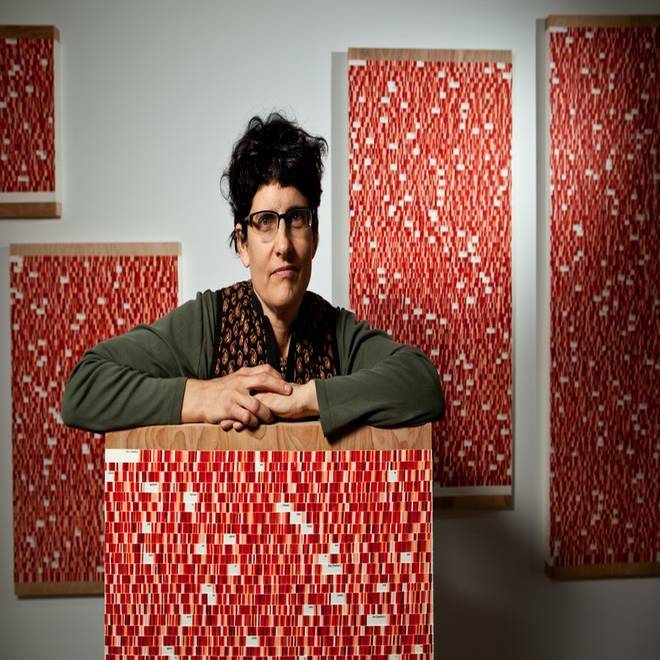 She calculates her financial loss at $350,000, hence the number of red stripes in her artwork. "I know that this show sounds like it’s about the cost of having been in that relationship, but what the meaning is to me actually is the cost of maintaining Orion's happiness and his future," she said of her son. "If I have to lose the house ... I feel like it's actually a small price to pay." To make the panels – each of which represents one paragraph of the court decision -- Phelps first counted the numbers of the letters in the text – approximately 13,000 -- and divided 350,000 by that number. That worked out to $26 a letter. She then took large pieces of paper and drew lines according to the value of each word. For example, a 13-letter word would be worth $338, and thus would be followed by 338 stripes. She glued words from the judge’s ruling on large pieces of paper and painted the lines around them, using a mix of watercolor and gouache – a form of watercolor with more pigmentation. She then cut the paper into rows and glued them onto birch plywood. At the bottom of each panel is the "cost" represented and the paragraph it represents from the ruling. Phelps, who had other artists help her with some of her earlier stripe art, said she wanted to do this one herself, even though it took her five months to finish it. “I felt like each stripe should be painted by me,” she said with a sigh. “It's like letting go of the house, every single penny of it. And once I’ve painted it, it's gone." She said she found the process peaceful and healing, though some viewers don’t get that sense when they view it. "People have said, 'Oh it's so dark … all that red is so angry,'” she said. “I look in here and it's glowing to me. … I feel like I accomplished what I set out to, which is to turn something that was depressing to me into something very beautiful."